Duterte now leads in 3 of 4 major surveys; may lead in all 4 pending Pulse Asia's April release. Davao City Mayor Rodrigo 'Rody' Duterte now leads in three out four major surveys after release of the latest SWS, Laylo, and DZRH survey results. Pulse Asia, the remaining survey firm, has yet to release its latest findings. With 27% of the sample favoring Duterte, the mayor emerged on top of the First Quarter 2016 Social Weather Stations (SWS) Survey, as reported by Businessworld today April 10th. The survey was conducted from March 30th to April 2nd via face-to-face interviews with 1,500 adults nationwide, where 92% are registered voters and with error margin of +/- 3 points at 95% confidence level. Trailing are Senator Grace Poe with 23%, Vice-president Jejomar with Binay 20%, Mar Roxas with 18%, and Senator Miriam Santiago with 3%. 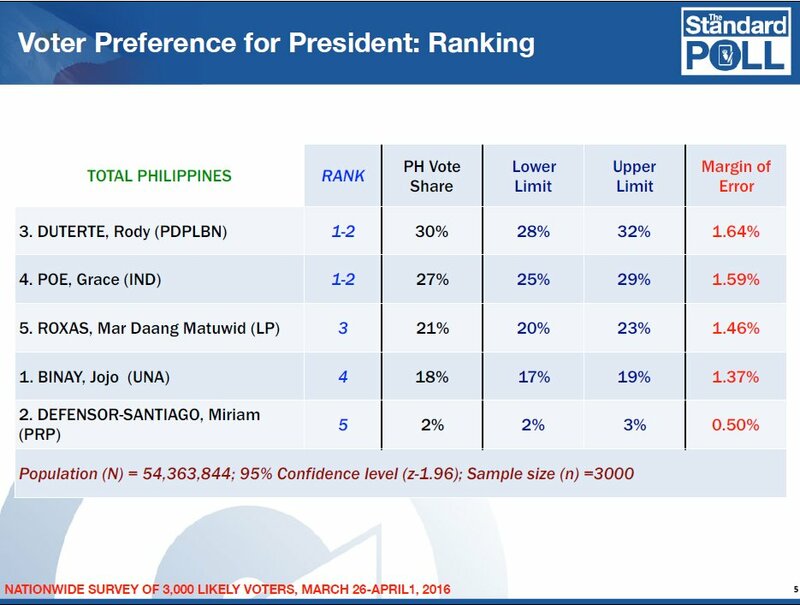 Note that his SWS Poll is different from the regular SWS-Bilang Pilipino polls. This survey's uses conventional face-to-face interviews, why the experimental SWS-Bilang Pilipino polls use data collected from respondents who were provided mobile phones. With 30 percent, Duterte was nominal topnotcher in the latest Businessworld - Laylo Survey. The survey was conducted from March 26 to April 1, 2016 on 3,000 respondents covering 79 provinces. The margin of error is pegged at +/- 1.8 at z-score of 1.96, indicating a pre-set confidence level of 95%. Owing to the error margin, Duterte is at a statistical tie with Senator Grace Poe who received 27%. Trailing are Mar Roxas with 20%, Vice-president Jejomar with Binay 19%, and Senator Miriam Santiago with 2%. With the support of 36% of 7,490 respondents, Duterte tops the Manila Broadcasting Company - DZRH survey conducted by Emeer 2 Research Services. The survey was conducted on April 2, 2016, via face-to-face interviews of 7,490 respondents covering all provinces. The margin of error is pegged at +/- 1.13 at 95% confidence level. Trailing are Senator Grace Poe with 28.2%, Vice-president Jejomar with Binay 15.3%, Mar Roxas with 15.2%, Senator Miriam Santiago with 3.5%. The late Roy Seneres got 0.8% while 1.8% are undecided. In the first DZRH 2010 Pre-election Survey conducted from December 12-19, 2010, then-Senator Noynoy Aquino topped the list with 45.7 percent of respondents’ votes. 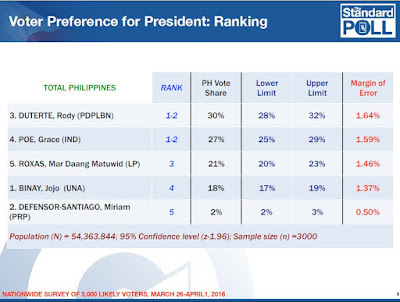 Aquino still topped the second survey with 37.1% of votes. 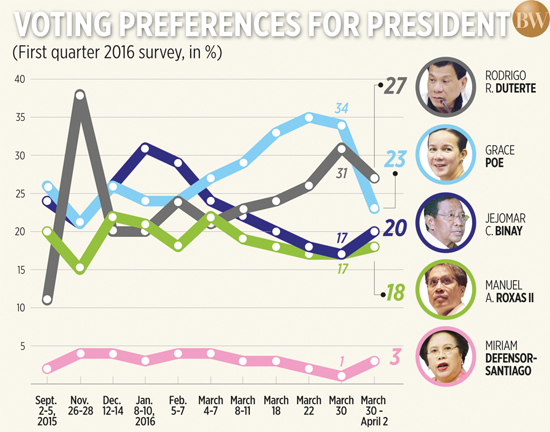 At 38.6 %, Aquino also topped the third and final survey conducted from April 5 to 12 2010. Former Senator Manny Villar consistently ranked second in the 1st, 2nd, and 3rd surveys, at 24.6%, 29.8%, and 22.8%, respectively. DZRH is the longest-running AM radio station in the Philippines. The organization has been conducting pre-election surveys since 2004.